Hello and welcome to the 15th installment of the SWD. A lot has happened in Aleppo governorate since last edition, last night there were multiple reports about SAA capturing Rashideen 5, there were also reports that said capture was only partial and reports that attack was repelled. Situation around Rashideen is still unclear and reports coming from it should be treated as unconfirmed until evidences can prove otherwise. It is still impossible to gather what is truth and what were lies spread yesterday about Tadef, everyone “agrees” that SAA is in control of town, as it was written here, probably some sporadic clashes occurred and whole thing was blown out of proportion. SAA Tiger Forces made huge advances today and linked with SDF stationed in Manbij region. Villages captured today are; Jub al-Hamam, Zuzurah, Jub Al-Sultan, Jub Al-Hamam, Jub Al-Khafi, Ja’iah, Khirbat al-Zib and Mushayrifah. With today’s advances IS–TFSA trading route has been cut for the first time. With SAA reaching SDF, some kind of quid pro quo supply route could be achieved, Afrin-Manbij for Aleppo-Qamishli route. SDF‘s spokeperson Talal SIlo made a statement that he doesn’t expect any clashes with government forces and that there is a somewhat mutually agreed truce. TFSA didn’t just stand still and watch SAA end their dream of taking Raqqa directly, they opportunistically captured villages in the newly created pocket near Al-Bab. SDF also didn’t stand sill, new operation was reportedly launched south of Manbij to capture Al-Khafsa. Some are saying that this operation is coordinated with SAA, but it wouldn’t be strange that this is just SDF being opportunistic, with their record, it wouldn’t be the first time that they act this way. SDF rapidly advanced against IS taking control of; Jurunli, Mahunah, Haymar al-Jays, Judayat al-Faras, Turaykiyat al-Humr, Qibab Kabir, Qibab Saghir, Sakhanah and Arudah with clashes already reported in Al-Khafsa. SDF could be trying to capture Al-Khafsah to use it as a bargaining chip in peace talks and maybe even to blackmail government with control of Aleppo’s water or they are just trying to block SAA from western bank of Euphrates in order to secure Tabqa and other areas for themselves. In case this operation is not coordinated with SAA, it could cause some problems as the main goal of SAA‘s eastern Aleppo operation is liberation of Al-Khafsa in order to restore Aleppo’s water source. Only thing we can do is wait and watch what comes out of this whole situation. Reports of SAA shelling one of Sukkariyah villages recently taken by TFSA and reports of clashes between TFSA and SDF in Manbij countryside. 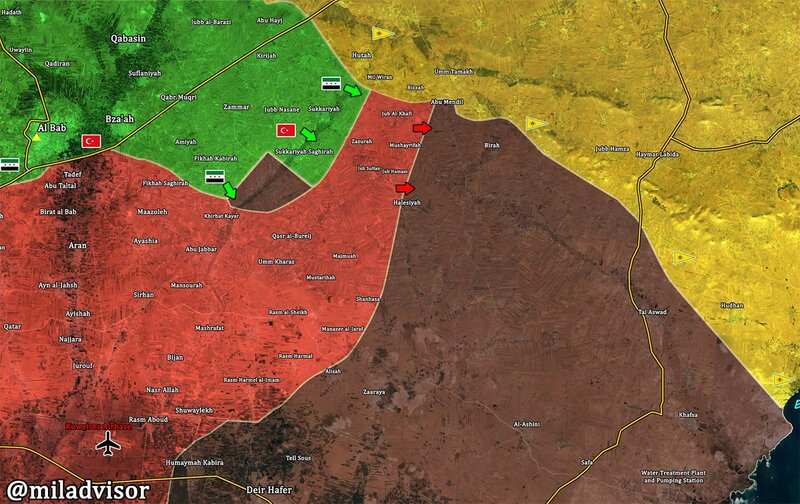 Rebels in the south managed to launch a proper counterattack and have taken some areas from JKW. Jallin, Tell Ashtarah and important Tell Jumoua overlooking the town of Tasil. With the capture of Tell Jumoua, Nawa is in a more safer position now. 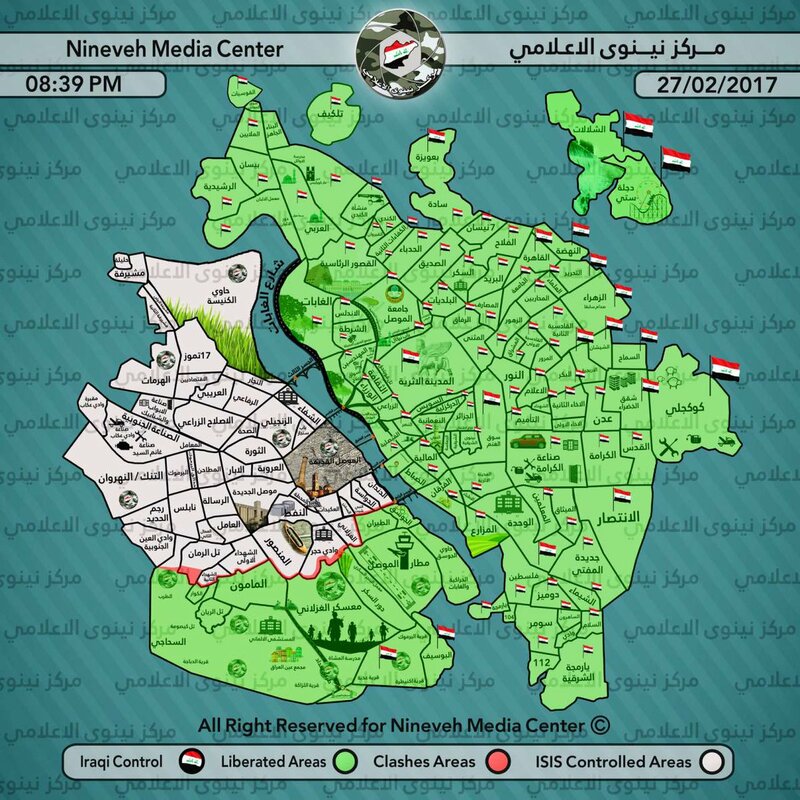 More advances were made today in Mosul with Iraq Joint Operations officially announcing Al-Tayran and Al-Jawsaq districts & 4th bridge completely liberated. Clashes were reported in Al-Mansur district. Tal Al-Ruman village southwest of Mosul was also liberated today. On the 26th of February 2017 CJTF-OIR has conducted 12 strikes in Syria. CJTF-OIR‘s main focus in Syria at the moment is still Raqqa where they did 17 strikes supporting SDF‘s operation against IS destroying a vehicle, a tactical vehicle and a mortar system. Other areas where strikes occurred include Deir al-Zour, Shaddadi and Palmyra destroying six oil wellheads, an oil tanker truck & a front-end loader, a vehicle-borne bomb and five storage units, three tanks, two vehicles, an oil storage tank, a pump jack and an ISIS-held building; and damaged two oil storage tanks. ,respectively. Full report on CJTF-OIR strikes conducted in both Syria & Iraq can be found here.